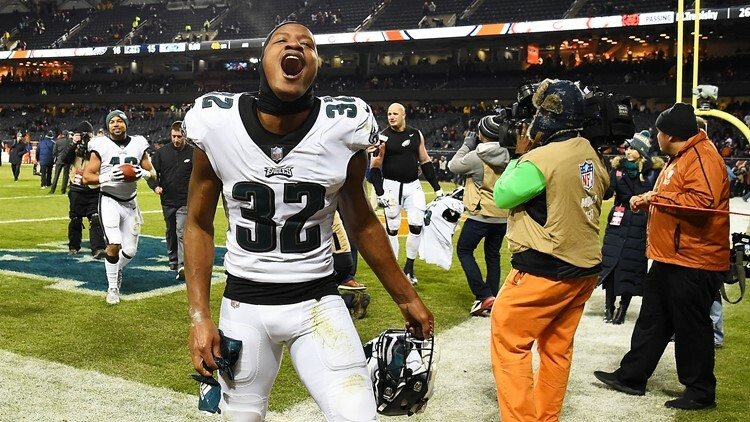 Rasul Douglas #32 of the Philadelphia Eagles celebrates their 16 to 15 win over the Chicago Bears in the NFC Wild Card Playoff game at Soldier Field on January 06, 2019 in Chicago, Illinois. The Bears had a shot at a game-winning field goal with 10 seconds left...but it hit the upright. Chicago — Nick Foles hit Golden Tate with a 2-yard touchdown pass on fourth down with 56 seconds remaining against the NFL's stingiest defense, lifting the Philadelphia Eagles past the Chicago Bears 16-15 on Sunday in the final wild-card game. "I think the big thing is, we saw some adversity tonight in the first half (and) I had a couple of turnovers," Foles said. "I think the big thing is that no one loses faith, no one stops believing, everyone just keeps talking, keeps believing in one another and we just rallied. Our defense really kept us in this game."